Lactura panopsia LACTURIDAE was previously called Lactura panopsia and some of the internet sites still use this name. 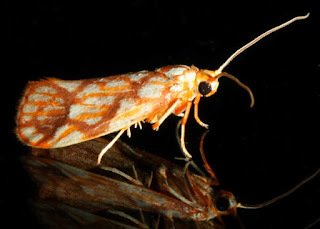 The super family of Lactura panopsia is ZYGAENOIDEA. Also see the notes below on all the variations of the Family of this moth. This moth has a range from the Bunya Mountains in Queensland to Kiama, south of Woolongong on the New South Wales coast. They are a tropical or sub tropical species so are more likely to be found near the coast. The Bunya Mountains, just to the West of us, has some rainforest, and often have unusual species for the inland. One interesting mention in Moths of Australia (Common 1990), is that the moths are "probably distasteful to vertebrate predators and, as they are extremely resistant to cyanide in killing bottles, may well be able to produce cyanide as part of of their defence, as do certain European species of Zygaena". The reference to the killing bottles, is that the author, Dr. I.F.B Common, was an entomologist, and when collecting moths they would use bottles with a small amount of cyanide (deadly poisonous for humans too) mixed with vermiculite then covered with a layer of freshly mixed plaster of Paris which was then allowed to set and a pad of moistened tissue on top. 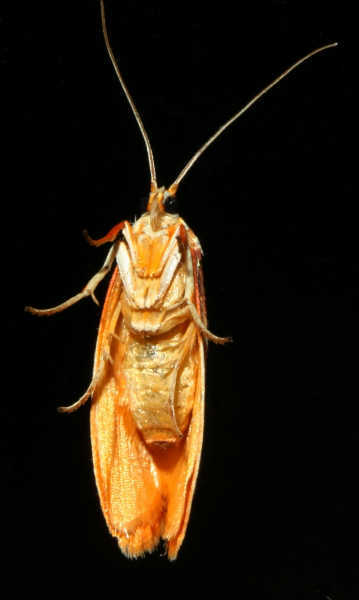 The idea is that it would kill the moths quickly with minimal damage, to later be pinned out. I would like to point out that this is not a process I use. I do not collect the insects and do not deliberately kill them. For the most part they are photographed live on the windows at night or around the property by day and, only for the odd occasion, I will catch them and put them in an aquarium for a short time to be photographed then released. Below is an assortment of the listing for Eustixis panopsia on various sites. Bowerbird have it placed in Yponomeutidae, and yet are quoted in another site as placing it in Lacturidae.